China's war on poverty is in danger of turning into a war on the poor. At China's 19th Communist Party Congress in October, President Xi Jinping renewed a lofty pledge to lift 70 million people out of poverty by 2020. That's a worthy goal in a country where over 43 million people still live on less than 2,300 yuan (S$470) a year, the poverty line set by the government. Roughly 40 per cent of the population, some 500 million people, get by on less than US$5.50 (S$7.30) a day. But that effort relies heavily on an opaque, arcane and already overburdened social benefits system that is likely to buckle under the strain - and on policies that may leave poor Chinese worse off than before. Mr Xi's pledge is an extension of the government's effort, starting in 2012, to move 100 million rural residents into the cities by 2020. Officials believe that urban life brings higher standards of living and, more importantly, increases domestic consumption to rebalance China's export-reliant economy. In a 2014 speech, Premier Li Keqiang vowed to "wage a war against poverty with a stronger resolve". The key to the plan, according to Mr Li, was to "relocate people living in inhospitable areas, and nurture small towns where the relocated (people) can enjoy the same public services as urban residents". But China doesn't want the poor moving to any old city. Thriving megacities like Beijing and Shanghai have officially capped their populations, following existing residents' worries that an influx of migrants could drown out their access to superior schools and hospitals. In November, the authorities in Beijing began aggressively evicting internal migrant workers by demolishing entire city blocks, in some cases with only a few hours' notice. Officially, this is a crackdown on "illegal structures" following a deadly fire that claimed the lives of 19 in a crowded neighbourhood filled with domestic migrants - but the result has been to render tens of thousands of people homeless in a freezing winter. To help keep numbers low in major cities, officials are encouraging, sometimes forcefully, rural residents to move to complexes on the outskirts of second-and third-tier cities such as Liaocheng, Zhengzhou and Ankang, which often lack critical infrastructure. Residents of these new towns have limited access to basic services like healthcare and education due to a severe shortage of medical staff and teachers. China's tiered system, whereby schools in the big cities receive more funding and better staff, leaves smaller ones struggling. More than a lack of services, rural transplants have been cut off from the subsistence-based life they once knew and thrown into a world they're unprepared for. The case of Ms Qin Huamei, 45, one of China's newest urban residents, highlights the pitfalls. A few months ago, Ms Qin traded her mud house in Guizhou, one of China's poorest provinces, for a new two-bedroom apartment in a white-walled government housing complex in Guiyang, the provincial capital, she told NPR. No longer does she have to draw water from the village well each morning - instead Ms Qin can simply turn the taps in her sink. "Life here is much better than in my hometown, but now I need money to pay for my food," Ms Qin said. "Before, we just ate what we grew." While life has improved, Ms Qin and other rural transplants must now find a way to earn an income. She is uninterested in any of the available jobs such as street cleaning, and is instead hoping that something better will come along once the technology park across from her building eventually opens. Even then, it's unclear if she will be able to get a job. With limited experience outside of farming, many rural transplants have difficulty finding and maintaining jobs. A study of 960 rural migrants who were resettled in Chongqing found that over half struggled to find stable jobs due to their unfamiliarity with the city and their lack of social networks. Villagers sometimes find themselves dumped on the edge of empty third-tier cities, which were largely built by overzealous provincial leaders who hoped to attract businesses and residents with glittering downtown buildings and empty malls. "Cities and extensions get built purely based on speculation, but not on direct demand," urban planner Eduard Kogel, who studies Chinese cities, explained to German public broadcast network Deutsche Welle. "Massive stretches are built, and it is assumed that the future growth and prosperity will somehow fill the space up." A study by a state-run think-tank found China's building boom created ghost cities with enough housing for 3.4 billion people - more than twice the country's population. Lured by government promises of relocation compensation, a new apartment and good jobs, many rural residents have joined the ranks of urban dwellers, but at the cost of becoming almost entirely dependent upon the government for what little income and benefits they receive. Under Chinese law, villagers have limited property rights. In the case of government land seizure, a farmer is entitled to only a small fraction of the land's value. Payouts vary from village to village and project to project, and nearly a quarter of the time residents get no compensation at all. But when villagers are compensated, they receive only 5 per cent to 10 per cent of the land's value, while the local authorities sell the land to developers for millions. A 2013 visit by The New York Times to a newly built town in Shaanxi province revealed that relocated residents huddled around open fires in their front yards despite having indoor heating because they could not afford the electricity costs. 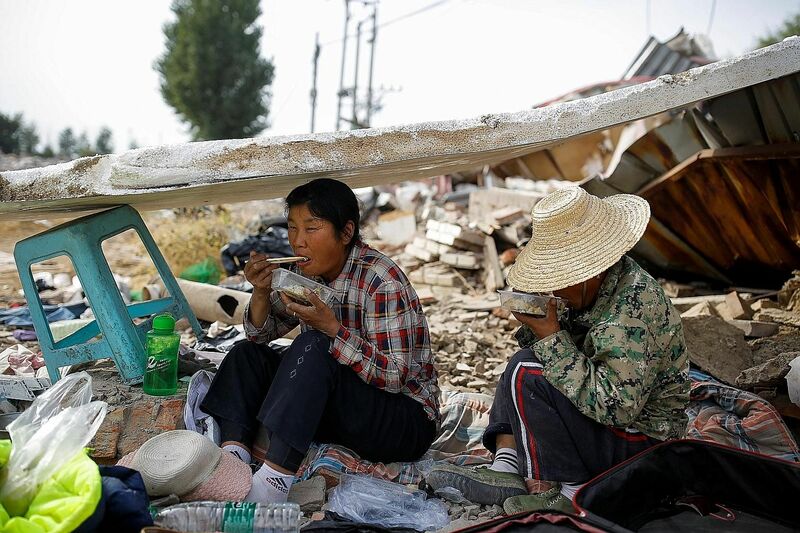 "The supportive policies can relieve poverty in the short term, but from a long-term perspective, they will easily fall back into poverty," Professor Yang Lixiong, who studies poverty at Beijing's Renmin University, told CNBC. According to Prof Yang, if the government were to cut back on infrastructure spending and subsidies for healthcare and education, as many as half of residents lifted above the poverty line in some areas of western China would fall below it again. By law, all Chinese workers are entitled to a pension, unemployment insurance, healthcare and housing assistance as well as access to public education. Providing rural transplants and migrant workers with the services they need is a prohibitively expensive proposition. The Chinese Academy of Social Sciences, a state-run think-tank, estimates that it would cost US$15 billion to provide a million new urban residents with crucial services like education and healthcare. Moving 70 million, as the government plans, would cost more than a trillion dollars, more than one-third of all current government expenditures. This additional spending comes as China's pension system is bracing itself for a wave of payouts. Due to the one-child policy, much of the nation's workforce is rapidly approaching retirement age while a shrinking number of young workers replace their ranks and replenish the pension system. An analysis by the Chinese Academy of Social Sciences shows the nation's pension fund surplus will turn into a deficit by 2023 and grow to US$118 trillion by 2050 if significant reforms are not made. On top of that, local governments are buried in more than US$2.5 trillion of debt. To fill their coffers, the cash-strapped local authorities have taken to the unsustainable practice of seizing land from villagers and selling it to developers. Over the last decade and a half, this has led to deadly clashes. China's anti-poverty plan hinges on attracting rural residents to second-and third-tier cities, but villagers have shown little interest in moving there. Instead, they have clung to their rural homes and travelled to thriving cities to seek opportunities. So to incentivise voluntary moves, the central government has promised massive infrastructure spending, linking every city with more than 200,000 residents by rail and expressways, and cities with more than 500,000 by high-speed rail. But it is unclear if the government can continue stimulating growth by pouring money into infrastructure, let alone maintain the pension system and fund needed improvements in healthcare and education. In August last year, the International Monetary Fund warned that China's aggressive debt-driven growth strategy was putting the country on a "dangerous trajectory". From 2000 to 2014, Chinese debt soared from US$2.1 trillion to US$28.2 trillion, and it is projected to rise to nearly 300 per cent of gross domestic product by 2022. The fate of China's war on poverty rests on shaky ground. Moving 70 million people out of poverty will require a complete overhaul of its entire social welfare system as well as trillions in new debt. However the cost is managed, China's farmers will have to suffer the consequences of the government's plans, as they always have.